I doubt I’m alone in saying I need another tearjerker, disease-of-the-week movie like, well, a hole in the head. Good thing HBO’s recent biopic, Temple Grandin, is no such thing. Sweet, studied, and poignant, Temple Grandin isn’t about overcoming a handicap, but instead it shows us how to look at the world differently and succeed. The movie’s protagonist, Temple Grandin, is a graduate student who has Asperger’s syndrome, a complex neuro-developmental disorder defined by impaired social interaction and other behaviors. Symptoms of Asperger’s and autism can include thinking of the world in a highly visual way (Grandin herself likens it to Google Images), which lends itself particularly well to the silver screen. In fact, the diagnosis has recently been re-classified as part of the autism spectrum disorder. Were this just a tale of one woman just overcoming a diagnosis, I’d probably start to reach for the remote. However, Grandin, played by Claire Danes, is accomplished in her own right as a doctor of animal science at Colorado State University and a prominent consultant to the livestock industry, having designed more than 50 percent of the cattle slaughterhouses in the country. No need to worry: HBO bought a herd of humanely treated cows for the film. 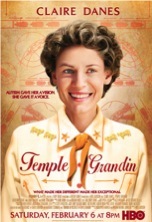 Temple Grandin, played by Claire Danes in the HBO movie. 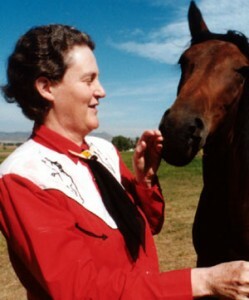 Yes, it is through grit, grime, and determination that Grandin has reached such acclaim, but she also credits her unique viewpoint to her understanding of how to humanely treat animals. Perhaps the best example of this is her “squeeze machine,” which plays off the fact that many people on the autism spectrum are extremely sensitive to both touch and sound. She created a device that gently squeezes cattle on the way to the slaughterhouse to reduce their anxiety and nervousness. The machine, as well as Grandin, is profiled in far more detail in neurologist Oliver Sack’s excellent book, An Anthropologist on Mars. In HBO’s Temple Grandin, Danes and cast do an Emmy-worthy job of making both slaughterhouse engineering fascinating, while making Asperger’s syndrome understandable. From a childhood diagnosis in the sixties — the Stone Age of “refrigerator mother” awareness — to an early introduction to ranch life via her distinctly warm mother, the movie explores both peaks and valleys with a deft hand devoid of Lifetime Channel sappiness. As the timeline ricochets between present and past, from condescending doctors and callous peers in her hometown of tony Bronxville, N.Y., to a connection with animals and a slow mastery of social skills, Temple Grandin succeeds in conveying a savant who is absent of the shadows of Rain Man, the Dustin Hoffman movie about an autistic adult man. Part of Temple Grandin’s beauty is that the scope of the character’s life, and the skill of Danes, work together beautifully to convey the story of a woman who is really just a lens for a larger understanding of the many types of autism. She does not, as many autistic characters do, serve as a poster child for all those with the disorder. The real Temple Grandin’s autobiography, Thinking in Pictures: My Life With Autism, purports to get down to the real issues affecting those with autism, and this film does an impressive job of the same. Temple Grandin will air on HBO for the next few months.